TambelanBlog :: IPv6 I Am Ready, Are You ? IPv6 I Am Ready, Are You ? Today I get a link that provides information about the launch of IPv6 on the 6th of June 2012. 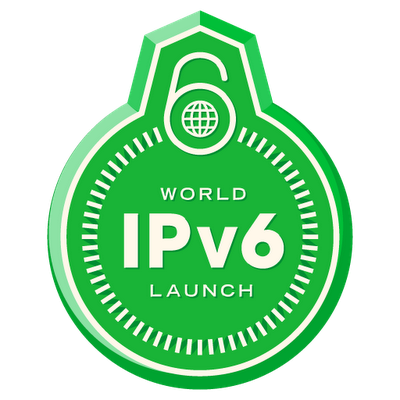 And as a form of participation and therefore I am today expressed support for IPv6, are you ready? A few months ago, or rather at the end of the 21-24 November 2011 in Surabaya Indonesia, held by APNIC IPv6 Workshop that I follow and a lot of important information. Information about IPv6 really very little is understood that the end of 2012 the availability of IPv4 will be exhausted. IPv6, or Internet Protocol Version 6 is the next generation protocol for the Internet. It was developed to provide several advantages over current Internet Protocol version 4 (IPv4). In particular, IPv6 and control information to route packets to the next generation Internet. The collection of information concering all aspects of IPv6, we hope to provide knowledge about this technology, will each of them could benefit. Hence it is called Internet Protocol Next Generation or IPng. IPv6 is documented in several RFC (Request For Comments or) from RFC 2460. Although IPv6 is the successor to IPv4, both protocol versions will continue to collect data for the Internet protocol in the coming years. Speaking of IPv6 addresses, the main problem is the limited number of IPv4 addresses to public addresses server. While IPv6 has a very large address space and consists of 128 bits as compared with 32 bits in IPv4. Hide multiple hosts behind an IP address pool) at the end-to-end nature of the Internet. Imagine, so many number of IPv6 can be given to every person who was on earth, even newborn babies can be given IPv6. So, are you ready IPv6 ? when will use in University of Riau..?? My bro @Arief Suseno : Basically we have started to prepare for all the administration for IPv6, and the University of Riau already have an ASN (Autonomous System Numbers) and also has IPv6 from APNIC.net and just waiting for the "right equipment" and the "right time" for the implementation process. "at least the end of 2012 we have started to migrate".